Back again for my third and final week. I’ve been trying to peer over the piles of soil that are neatly piled up by the side of the road as I drive to work but not seeing anything. Still, there were the Open Days to attend, they were brilliant. I borrowed a couple of children from my friend to allow full participation in pot making, identifying finds and trowelling for hidden finds as well as grinding wheat and peering down holes in the ground. The kids enjoyed it too! By Thursday I was really keen to get back and see the team and find out what had been happening (constant website and blog checks did not help!) but imagine what it was like on the afternoon when driving home and I could see mechanical diggers on the site with the fully excavated barrow and henge – a few texts to my spy in the camp revealed that it was being covered in. I felt sick, but at least it had been recorded in detail and we had all had a chance to see it. Monday, Bank Holiday, site closed, sat twiddling my thumbs, roll on Tuesday when it was back to the Holiday Inn to meet up with the pals, Cheryl, Gavin, Les, Brian and his daughter and John. We were all a bit quiet as this is our final week and there was an undercurrent of sadness that no one wanted to mention. The difference in a week was amazing, the ring barrow now had lots of excavated trenches around it showing its size and depth as well as variations in the sides, loads of worked flints had been found in at least two of the trenches and further up the site, on another area which had been cleaned previously, trenches had appeared so after a look around to see the changes and say hi to the guys it was back to work with Cheryl and Paul in the big barrow taking measurements and drawing diagrams to show differing fill levels and position of stones, flints etc. That took up most of a day and a half and in the rain too – fortunately we were prepared but the thought of a hot bath was a sustaining thought. Then it was down to the other end to extend a trench that had been started and was to be extended, the original trench had turned out two really lovely flints and a piece of Roman pot so there was hope of finding more. Cheryl pound a small piece of pot and some more worked flint but it was back to the mattock, shovel and barrow for me. Next day Gavin, Paul and I got to work carefully taking away more of the trench. Both of the guys were finding lots of pot, three large finds bags, the most that had been found on the site to date, how good was that! It appeared to be a mix of Bronze Age and early Roman. Still more digging to do and then I saw it, a tiny dark smear in the ground – could it be? Down with the mattock and grab a trowel, carefully now, take it slowly, no rush. I started to clean around this little mark and there it was, my first find, a little piece of pot size of my thumb nail, thick and black with little white fleck of flint that had been incorporated to stop it shattering when it was being fired. In the great scheme of things it may seem pretty insignificant but I couldn’t have been happier if you had given me the crown jewels. This must be the lucky trench because there was more and more, some with lines forming patterns on the surface and that was the end of a perfect day, it was time to down tools and go home ruminate over it all. What will we find tomorrow, the last day for us volunteers, who knows. No matter what it can’t beat my little bits of pot. Or can it? Week 2 began with a few aches from the previous week’s toil, but here I was, just as eager to get going as before. After free coffee and pastries in the Holiday Inn catching up with my digging pals Cheryl, Les and Gavin, we walked over to the site. Briefings over and new volunteers welcomed, it was time for a new challenge. I was set to work helping Artur, the archaeologist I had worked with the previous week, to excavate a trench in the area that we had cleaned on the first three days. The whole of the Bronze Age barrow had been marked off with string held taut by nails so we could clearly identify the sections. This was going to be a challenge from last weeks toil as we would use mattocks, shovels and a wheel barrow to begin with, the trowels and brushes would come in to play later! Artur had started the proceedings by breaking up the surface and then I was let loose with the mattock. This was where I came into my own, we quickly got into a rhythm; one mattocking and shovelling spoil into the barrow, the other would empty the barrow. Then get in the trench and it all starts over again. This continued for two and a half days by the end of which we had reached the bottom of the ring ditch and the sides were cleaned, this trench was now approximately two metres long, a metre wide, and over a metre deep. Lisa, a fellow volunteer came to help too and that made the work easier and we began to trowel the sides and brush the surrounding area to prepare them for recording. The weather was amazing throughout all of this, very hot and sunny with just the slightest hint of a breeze. Sunscreen and ice cream were definitely the only way to get through the days! 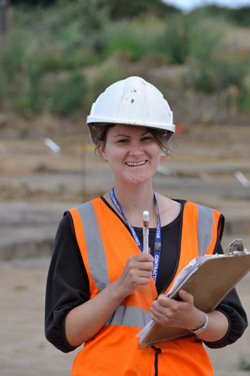 Vix, the Project Officer, in her quest to ensure we were not getting bored arranged for us to do a bit of surveying. Back to the feelings of day one – apprehension and nervousness, surely this was all too technical for us volunteers? But no, there we were with all this stuff, measuring poles, tapes and dumpy levels. We were shown how to set up and use the equipment by Vix and Alex and after a few practice runs we were taking the measurements which would provide vital information about the barrow we were working on. During the week I had been watching all and sundry finding beautiful pieces of worked flint, pieces of pot – both Bronze Age and Roman, animal teeth, horses jaw bones, oyster shells and even a Roman nail. But me? Nothing. But I was undeterred, just to see this stuff coming to light was incredible. We ended the week washing the finds from our site in the portacabin we have our breaks in. Bones, pot and flints carefully cleaned in water with a toothbrush, shells were gently brushed and cleaned with a wooden skewer to remove all traces of soil and placed in trays with their identification bags alongside. The perfect end to a brilliant week. I have to go back to work for a week now and am none too happy about it, but needs must. I’m not sure how I will be able to concentrate when back in my dark office after two weeks in the fresh air doing extraordinary things, I will let you know when I get back. Bye for now. You will not be able to imagine the feeling of excitement and apprehension I felt on the first day of my two weeks volunteer work on the dig. I had no idea what to expect and if it had been my job to make tea for everyone that would have been fine. What a relief to meet the other helpers and as some of them had already been on site I was reassured that I would be fine. After being briefed on site safety and collecting my tools I followed the others out onto the site of a Bronze Age barrow. The task ahead was to ‘clean’ it for pre-excavation pictures – not as easy as you think; it took three days with 20 people on their hands and knees carefully trowelling a layer of surface soil from the feature. I can honestly say that my wrists have never been used to such work and knees were glad of any chance to straighten up! It might sound like purgatory but the sense of fun and excitement as well as enthusiasm for this job made it fly by. The archaeologists working alongside were amazing, making it all feel like true team members as well as telling us so much about the work that they do and the local archaeology. Amazing to see what lies beneath your feet and to be shown how to recognise some of it too. On Thursday we were split into smaller groups and I was tasked to excavate a small oval feature with a sherd of pottery on the surface layer of soil. This meant more careful cleaning and removal of spoil (the dirt you’ve cleaned off) before careful photography, then measurements are taken and then the digging begins! Although only about a foot long and 18 inches across this little hole went down approximately 3 feet – I ended up removing spoil whilst lying on my stomach with my right arm down the hole! Not easy, especially when you’re not use to it. Once the bottom was reached, it was back out with cameras and measuring tapes then diagrams and descriptions, all have to be recorded for posterity – all very important as this will all soon be covered by the new road. I must add that all of this work was done with the help of one of the team members – he was so informative and ensured that I know exactly what I was doing and why. A huge ‘thank you’ to him. It seems that the feature was the foundation for a post (a ‘posthole’) and was unusual on this site as no others have been found, what a privilege to have been given this opportunity. Who knows what week 2 will bring?.. The days slipped by, faster than I would have believed, but then, as the saying goes, time flies when you’re having fun. And fun we were definitely having. Why digging a great big hole in the middle of a field is fun, does, I agree, take a little bit of explaining, and I am not sure I can. Firstly I’d broken the golden rule. ‘Never volunteer for anything.’ Several of my friends had pointed this error out to me. They were also totally gob smacked that I was giving my time for free. But then I am a time millionaire. I think the thrill, because that’s what it is, is that I am touching history. The flint tools I have found were last touched, probably by their maker, around four thousand years ago. Just think about that for a moment. Prehistoric. Pretty much everything I know about history happened during, and after the Roman invasion. This stuff was made around two thousand years before that. So that’s from me to Julius Caesar, that’s just the half way point, then on into the past for another two thousand years. We were excavating a field, about a mile from where I was born. Where people had lived and died all those years ago. What sort of people? I don’t know. What I did know was, that this was an awful place to have lived, on this exposed ridge. So they must have lived further down the hill, towards where the current village of Minster is today. They might have been Bronze Age people, or earlier, but they weren’t stupid. What they were was skilled toolmakers. Some of the blades I had found, would put my Stanley knife to shame. One of the professional archaeologists suggested that the barrows, and henge’s we had uncovered might be aligned with Orion’s Belt, they wouldn’t have called it Orion, but they could recognize the constellations, and used them. So not stupid, just primitive, just doing the best they could to live, eat, keep warm, and look out for their families. Same as us then. I’d been asked to dig part of the ring around the barrow we had cleaned on our first week. Luckily I didn’t have to use a trowel. Not this time. This time I was handed a heavy mattock, and a shovel. I went to work. This was heavy work, shame we couldn’t have done this the week before, when I could have done with warming up. Luckily I wasn’t alone. Keith, one of the other volunteers, worked, or sweated alongside me. I swung the mattock, he shovelled, then we swapped over, through the morning, and on into the afternoon. The next day I was on my own. Keith not being a time millionaire had gone back to work. I carried on, Alex gave me a hand, and so occasionally did Nick, a powerhouse of a bloke, who looked more like a rugby player than an archaeologist, but somewhat of an expert on the subject of flints. Lucky that. Eventually we reached the bottom, solid chalk, I’d dug to a depth of 1.2m, no deeper of course, that would be strictly against the rules. Now where was that tape measure? The original trench, dug all those thousands of years ago with antlers and the bones from a cows shoulder blade (or scapula), could now be seen, even by me. The sides of the ditch showed the layers of soil which had then refilled the ditch over the millennia, the soil washed in by rain, then some more substantial infill, and finally, the top layer, from when the mound was smoothed out when the field was ploughed, level. When I had volunteered I had expected just to labour, push a wheelbarrow maybe. Not a bit of it. We were doing the same work as the professionals, and that included recording what we found. Photos, scale drawings, sheets, and sheets of written descriptions of what we dug. It took me back to the maths classes of my youth. I wasn’t very good at it then, now I just couldn’t see the smallest of the grid squares! Now it was time for a break. Vix, the site’s boss had brought us all an ice cream. I could get used to this!